Thanks for stopping by today! 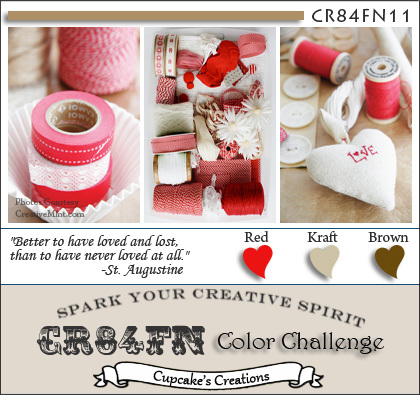 This week CR84FN brings you another beautiful color challenge of Red, Kraft and Brown! Aren't these colors wonderful together! Lately I've been moving away from creating A2 sized cards and have been making a lot of 5-1/4" square cards. I just love the way Heartfelt Creations Decorative Window Scene Die looks on the larger sized cards. The Kraft panel is Dry Embossed using a Texture Plate, then lightly sponged with Chocolate Ink. The Tulip is Brown Embossed, then paper pieced with Basic Grey Curio Paper. I embossed the Tulip a second time and popped up a layer for added dimension. Here's this weeks color inspiration, we'd love for you to play along with us at CR84FN, you can find all the details here on how to enter. If you upload to any online gallery please use keyword CR84FN11 so we can find your creations! Lisa, your Sympathy card is stunning! The decorative window is so pretty and I love that gorgeous rose! Very pretty, Lisa. Hope all is well with you. Oh my!! What a fabulous card! The rose is stunning! Sympathy cards are so hard to make, but this is lovely. The tulip is simply beautiful and the sentiment is just right. Lovely card! Beautiful card. The window die cut is beautiful and love how you have framed your gorgeous tulip! Just beautiful! That flower just pops off the page, looks so real. Those are beautiful colors! Love the window and your tulip is incredible. Tulips are my favorite, but don't grow well here! Have a lovely Sunday! What a lovely sympathy card, Lisa! 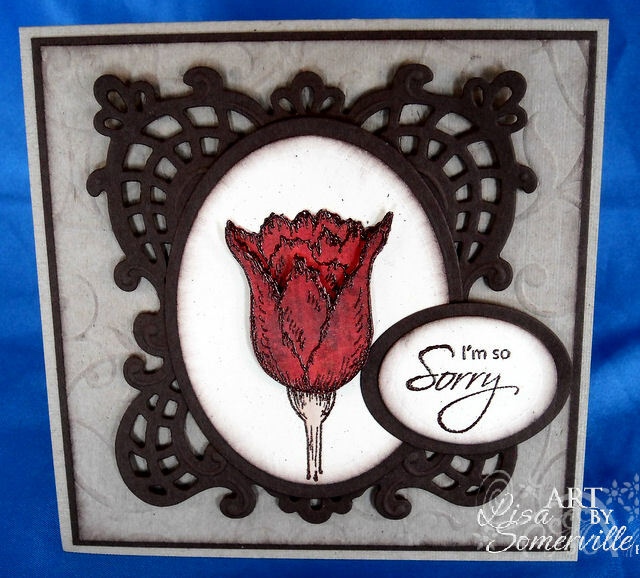 Love the intricate frame die cut and your stunning tulip! Beautiful tulip, love the light embossing on the background paper and that die cut is awesome! That is a great size card too, I've been making more of those too since there are so many great die cuts and nesties out there. Beautiful work. This is stunning! I love the window. The Heart Felt Creations are wonderful! I love the way the rose came out. It is beautiful. The sentiment could be used in many situations. This is really lovely. Love the square cards and these die cuts are beautiful! 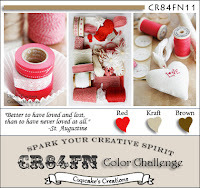 Can't wait to try this challenge, love these colors together. Love the clean elegance of this beauty! Gorgeous Lisa!!! LOVE that rose - just fabulous. Such a wonderful sympathy card. Great take on the challenge colors! Wonderful inspiration! LOVE how you created that extra layer to your flower! Just a STUNNING detail! I also LOVE that you are making bigger cards!